Los Gatos, CA, June 17, 2015 – Home Automation was gaining attention and experiencing robust growth in 2014, however a new report by Argus Insights reveals that sector is quickly losing steam. 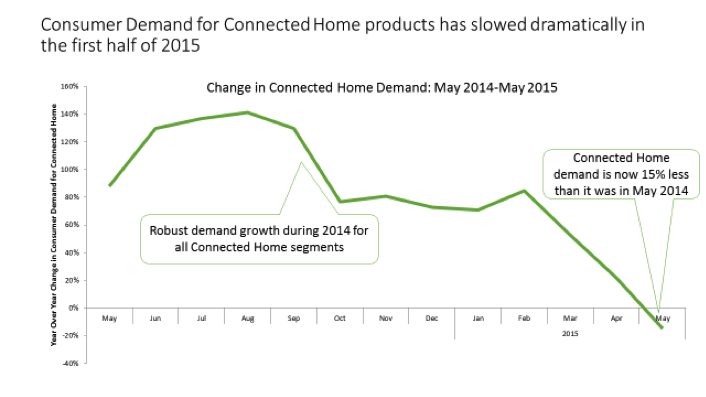 Data show that as of May 2015 consumer demand for connected home devices such as thermostats, lightbulbs, locks, sensors and cameras experienced its first drop below the level of a year ago, a sign that consumer interest is stagnating. Argus Insights Home Automation report is available here: http://www.argusinsights.com/connected-home-2015/ . Argus Insights proprietary data on the Connected Home shows that, as of last month, consumer interest in the devices actually fell to a level 15-percent below where it was 12 months ago. The report discloses that all smart home devices suffered from waning interest, and while security cameras consistently generate the most interest, they are also suffering a significant drop in demand compared to 2014. 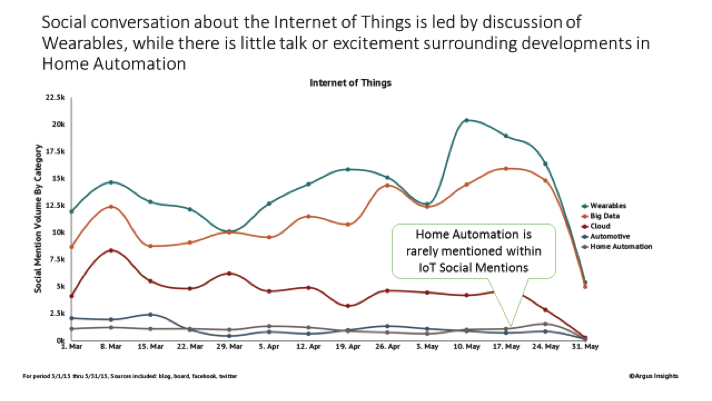 Even the analysis of social conversations regarding the Internet of Things supports waning interest and investment in the Connected Home market. Within IoT conversations, Wearables dominate the mindshare, mentioned 10 times more than Connected Home. Social Conversations, which reflect a mix of consumer anticipation and corporate marketing, are both slacking for the Connected Home market. The Argus Insights’ analysis of over 12,000 consumer reviews of security cameras from Feb 1-May 31 discloses major negative issues such as persistent problems with reliability as well as trouble with connectivity. Earlier Argus Insights research highlighted that most consumer animosity arose from the frustrating and time-consuming challenges of connecting these devices to the home WiFi network. According to the consumer responses, the reliability problems associated with security cameras led to higher returns than expected. As new customers investigate their options and find products that are difficult to set up and fail after just a few days of operation, much of the market is passing on purchasing new Connected Home devices this year. These issues impact even the most popular smart security cameras, as represented by major brands such as Dropcam, DLink, Netgear, Foscam and Tenvis. Demand for these products has dropped drastically over 2014. For more information about the Argus Insights Connected Home Report, visit http://www.argusinsights.com/connected-home-2015/. Argus Insights is Silicon Valley’s first big data driven Market Coach. Recognizing that companies are constantly striving to achieve and sustain market fit in the face of competitive threats and shifting customer preferences, Argus Insights continuously monitors and analyzes millions of consumer touchpoints to measure the degree to which products satisfy market demand. Through insights derived from the firm’s proprietary customer insights platform, clients take targeted actions to improve market fit and revenue performance so they can surpass the competition. Argus Insights coaches well-established and developing companies from Fortune 100 to small startups on market fit. We publish monthly market fit reports for a variety of B2B and B2C markets immediately at the month’s close while other firms force clients to wait a month or more for results. Take action today, visit http://www.argusinsights.com/ .